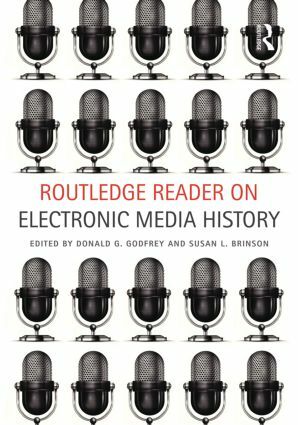 Media archival collections have grown and represent an increasing acknowledgement of and opportunity within electronic media history. The objects of media history are as broad as the term itself. Today’s historians build on existing research just as today’s electronic media engineers and scientists reference the historical patents and technology of the past. Meehan, "Critical Theorizing on Broadcast History"
Sterling, "Decade of Development: FM Radio in the 1950s"
Schwalbe, "Jacqueline Kennedy and Cold War Propaganda"
Hilmes, "Invisible Men: ‘Amos ‘n’ Andy’ and the Roots of Broadcast Discourse"
U.S. Spanish Language Broadcasting, 1930-1980"
Karnick, "NBC and the Innovation of TV News: 1945-1953"
Tet Offensive and Chicago's Convention"
Aufderheide, "Public Television and the Public Sphere"
Voice of America, BBC and Deutsche Welle"
Czechoslovakia and Wireless Propaganda in the Sudetenland, 1941-1945"
Given, "Another Kind of Empire: The Voice of Australia, 1931-1939"
Guo, "A Chronicle of Private Radio in Shanghai"
Hampton, "Early Hong Kong Television"
Kerr, "African broadcasting pioneers and the origins of radio drama"
Part VI: Law, Regulation & EthicsHugh G.J. Aitken, "Allocating the spectrum: The origins of radio regulation" Armstrong, "Constructing Television Communities: The FCC, Signals, and Cities,1948-1957"
Stavitsky, "The Changing Conception of Localism in U.S. Public Radio"
Horwitz, "The First Amendment Meets Some New Technologies"
Leslie, "Ethics as Communication Theory: Ed Murrow’s Legacy"
Levine, "Television Journalism on Trial: Westmoreland v. CBS"
Limburg, "The Decline of Broadcast Ethics: U.S. v. NAB"
Gomery, "The centrality of media economics"
Mullen, "The pre-history of pay cable television: an overview and analysis"
Parsons, "The Evolution of the Cable-Satellite Distribution System"
Newell et al., "The Hidden History of Product Placement"
Sivowitch, "A Technological Survey of Broadcasting’s ‘Pre-History,’ 1876-1920"
Donald G. Godfrey is Professor Emeritus at the Walter Cronkite School of Journalism and Mass Communications at Arizona State University. He is a Past President of the Broadcast Education Association (BEA); served as President of the National Council of Communication Associations (CCA); as editor of the Journal of Broadcasting and Electronic Media for four years; and is former Curator of the CBS-KIRO Milo Ryan Phonoarchive, a CBS Radio News World War II archive, today at the National Archive, Washington, D.C.
Susan L. Brinson is Professor of Communication at Auburn University. Her research focuses on television history, broadcast regulation, and media representations of identity. She is the author of two books and co-editor of an anthology. She served as editor of the Journal of Broadcasting and Electronic Media for three years.